Explore Charles’s Law—in a syringe. Discover the relationship between the temperature and volume of a given amount of gas. Prepare four beakers with four different temperatures of water—some warmer and some cooler than room temperature. You can use the ice to create cool-water samples and the microwave to heat warm-water samples. Label them “hot,” “warm,” “cool,” and “cold,” just to help you keep track. 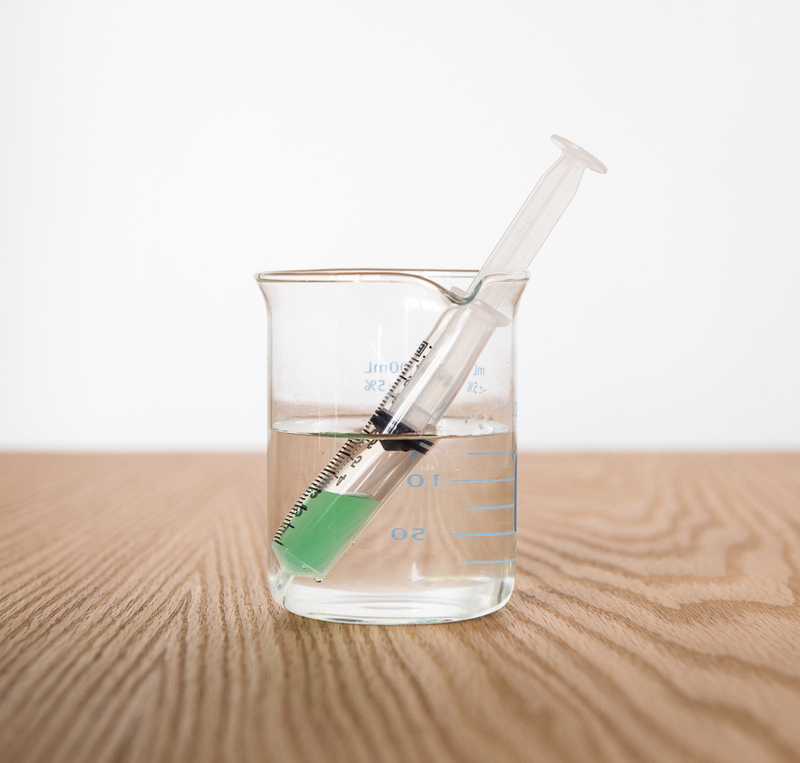 Fill the last beaker with room-temperature water and label it “room temp.” Add a few drops of food coloring to the room-temperature water to better visualize the movement of fluid in the syringe. Move the plunger on the syringe so that one third of the barrel is full of room-temperature air. Submerge the syringe tip into the room-temperature water. Draw up the colored water until the end of the plunger is at the maximum-volume marking on the syringe. On a piece of notepaper, record the volume of air trapped in the barrel by subtracting the volume of the water in the syringe from the maximum volume of the syringe. Then record the temperature of the water in degrees Celsius. Quickly transfer the syringe into a beaker filled with water of a different temperature (either heated in a microwave or cooled with ice), making sure that the barrel is fully submerged. Hold the syringe upright so the water blocks the opening at the tip and the air is trapped inside. Repeat the process of transferring the syringe into the other three beakers until you have volume and temperature data for at least five different temperatures. Reheat or re-cool any beaker-water samples that have become room temperature. Plot the points for each volume (ml) and temperature (K) on a Cartesian graph. Do you notice a trend? Charles’s Law states that, at a fixed pressure, the volume of a given amount of gas is directly proportional to its temperature. This means that if the temperature of a gas increases, its volume should as well. By leaving an air gap in the syringe barrel, you trapped a fixed amount of gas. Initially, the system is balanced, and water will not move in or out of the syringe unless there’s a new force. When the trapped air increases or decreases in volume due to a change in temperature, water acts as a piston, moving in or out through the tip until the pressure is equalized. You should have noticed that the volume of air in the syringe barrel changed when you brought it to a different temperature. By plotting volume versus temperature on a graph, you may also have noticed that the points tend to line up along a straight line. You could represent the equation of the line as V = kT, where V is the volume, T is the temperature, and k is a constant (the slope of the line). This is the mathematical representation of Charles’s Law. Charles’s Law can be combined with Boyle’s Law (which relates pressure, P, and volume, V), Gay-Lussac’s Law (which relates temperature, T, and pressure, P), and Avogadro’s law (which relates volume, V, and the amount of gas in moles, n) to form the ideal gas law: pV = nRT.